The paths they took were different. It was not always a direct route, however, through prayer each one reached the same destination – a commitment to religious sisterhood. 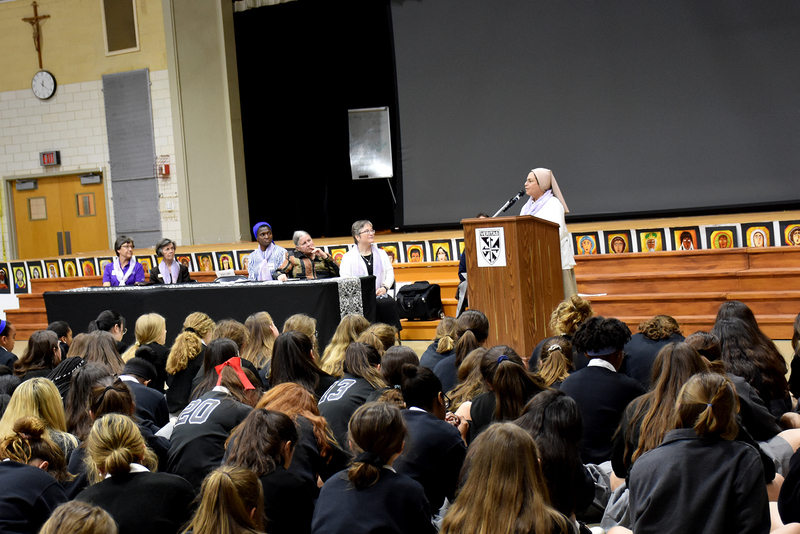 Addressing an assembly of 8th graders and freshman, Sister Evelyn N. Okoye, SSH, Sr. Gloria Murillo, STJ, and Sr. Kathy Broussard, OP shared with the students the courses they took to their commitment and the rewards from their diverse work today. The sisters were part of a program coordinated by Sr. June Fitzgerald, O.P. 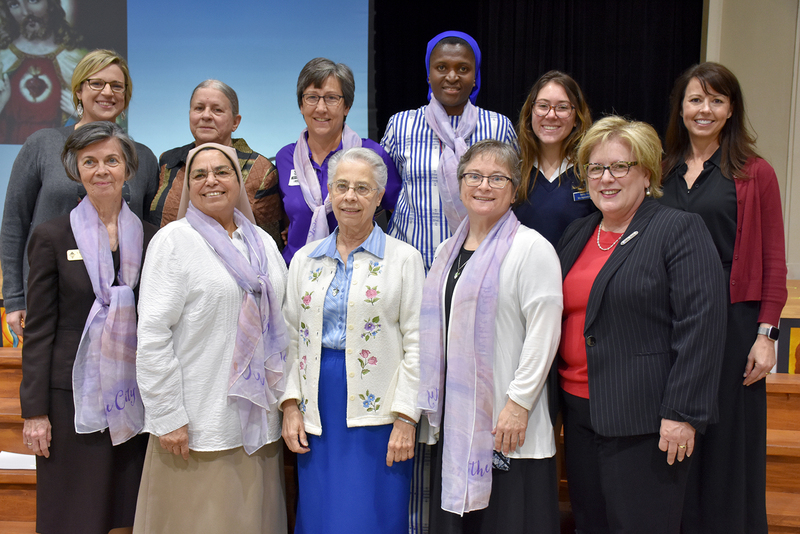 Vocation Minister, Dominican Sisters of Peace, in observance of Women’s History Month and National Catholic Sisters Week. Student preacher Bailey Mipro served as moderator. Sister Evelyn N. Okoye, SSH, from the Eastern part of Nigeria in West Africa, is a Sister of the Sacred Heart of Jesus. She has been a member of her community for 16 years. She earned her first degree in theology in Nigeria in 2012, a Masters in Christian Spirituality and a certificate in Spiritual Direction from Creighton University in Omaha, Nebraska. 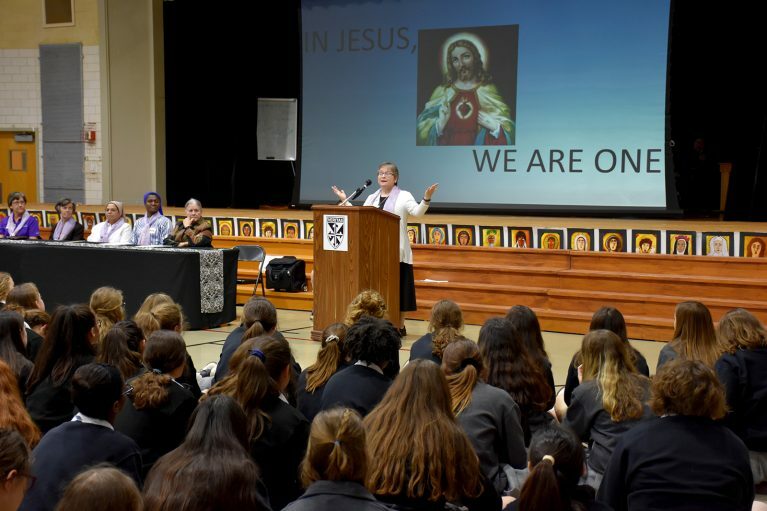 Since October 2014, she has been in New Orleans, ministering as a religion teacher at St. Mary’s Academy New Orleans. This summer she hopes to return to Nigeria. “God does not take us on the same route. 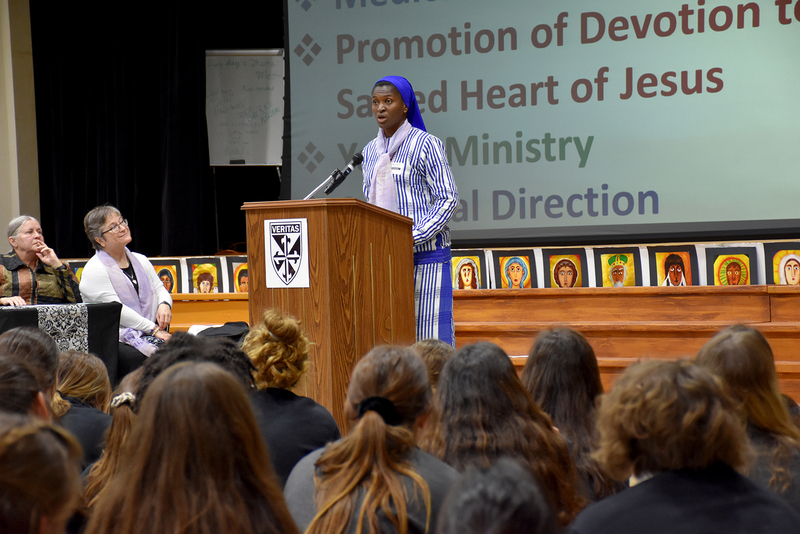 It all depends on where God is calling you,” offered Sr. Evelyn. “I kept asking myself, what does God want me to do? I needed a GPS because I did not know where God was calling me to be.” She found that GPS in her spiritual director who tasked her to focus one week imagining her life as a mother and wife. The following week the exercise was to live as a religious sister. After each week, her director asked her if she found fulfillment and also peace with God. After the second week, she embraced God’s call and joined the Sisters of the Sacred Heart of Jesus. Sr. Gloria Murillo, STJ, born in Honduras, grew up in New Orleans. She has been in religious life for 30 years as a member of the Society of St. Theresa of Jesus. Sr. Gloria has served in a variety of ministries over the years including Religious Education and Campus Ministry, as Director of the Archdiocese Spirituality Center and 20 years in Vocation Ministry. 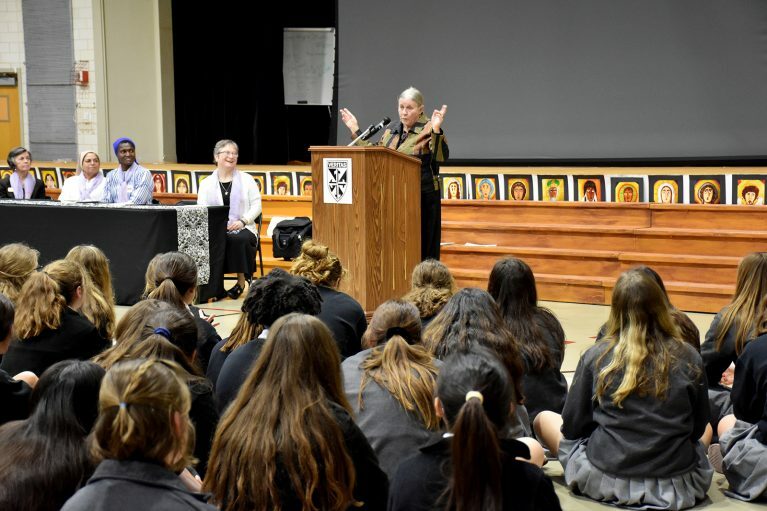 Currently, she is serving as mentor for the Magnificat House of Discernment in New Orleans, a place where young women come to discern if they have a religious vocation. “I’m what you call a special candidate, as I entered the order in my 30s,” she added. “I wanted to be a lawyer. Right after high school I left the Church for 13 years. I did not believe in God. 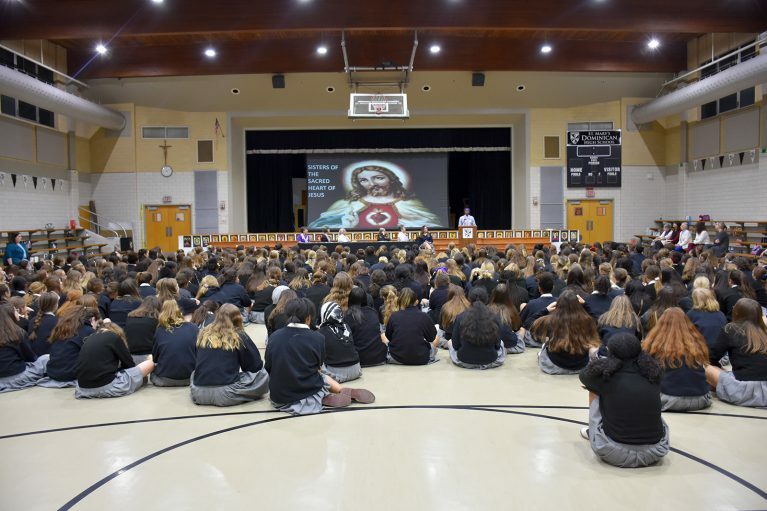 I came back after my mother asked me to help her decorate the church.” That return led to her work as a CCD teacher and later taking theology classes at Loyola University. She volunteered with the Missionary Sisters of St. Dominic in Arizona where God’s plan became clear to her when she was praying in the desert.